This Atomos Ninja V 5" 4K Recording Monitor with 2TB Sony AtomX SSDmini Kit put together by B&H consists of everything you need to record HD video to an external SSD. 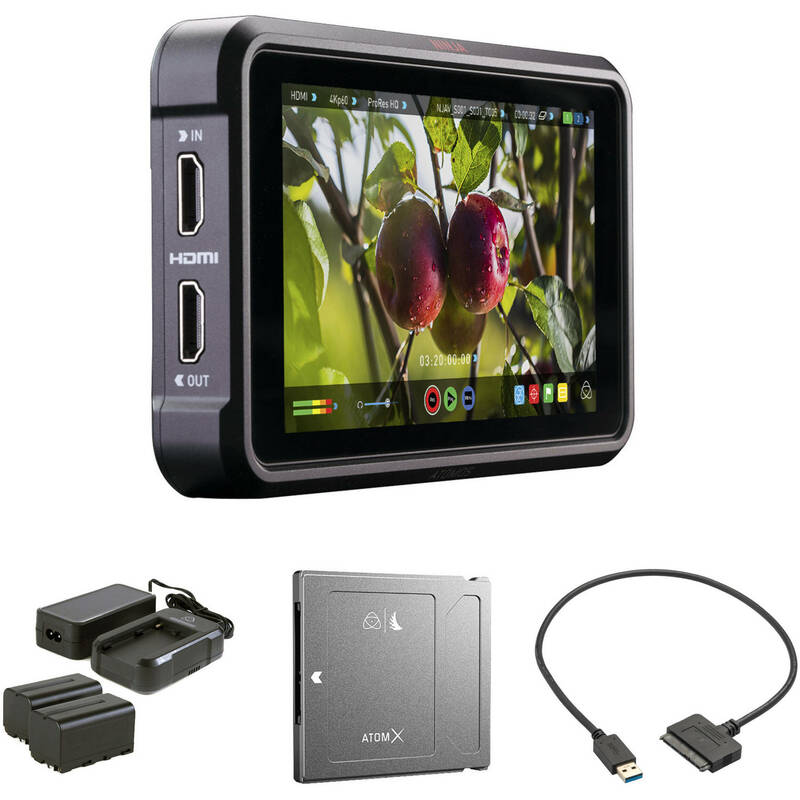 The kit includes a 5" Atomos V recording monitor, two L-series batteries, a battery charger with AC adapter, a 2TB Sony AtomX SSDmini, and a USB to SATA III connector cable. The 1920 x 1080 display features 1000 cd/m² brightness and a 10-stop dynamic range, supports popular log formats, records and plays back up to DCI 4K video, and includes an HDMI input and output. The Ninja V can record video up to DCI 4K onto the included AtomX 2TB SSDmini using the USB to SATA III adapter cable. The included power kit provides two L-series batteries with a charger to power your Ninja V.
Ninja V 5" 4K Recording Monitor with 2TB Sony AtomX SSDmini Kit is rated 3.6 out of 5 by 27. What is the bit rate for 4K 30fps or 1080P 60fps from a Sony A7III. Or what file size would 10 minutes of video be? Hello Richard, the general rule of thumb is about 100 GB per hour on HD and 400 GB on 4K. you'll have to check on ProRes or DNx white paper. The batteries with this kit, are they OEM? (If not, what brand are they?) Also, does B&amp;H have the coiled HDMI cable needed to shoot 4k 60p on the GH5? Thanks! Hello, got a few questions. First, I asked this already, but it somehow got lost, can Nintendo Switch be recorded like that if the PS4/Xbox One? Also, the Atomos site mentioned an accessories kit; will that be available in the near future and will I need to buy SSDs separately if I choose that option? Hello, you can most definitely record from a gaming device HDMI source no problems. and yes sine we don't make any SSD's or media, you'll have to purchase that separately. currently we have no announcement on an accessories kit for the ninja v.